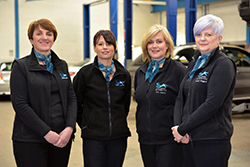 This month we are delighted to launch our Female Drivers Female Focus page which demonstrates our sensitivity to how our workshop operates, so that we may encourage more female customers to use our knowledge and services. Booking a vehicle service or repair can be a daunting task in terms of understanding a conversation with regards to mechanics. In addition, no one likes to use an oily and dirty workshop that has very little facilities. work, so that customers are clear along each step of the work. Our spacious workshop is well maintained and regularly kept tidy so that female drivers and customers have peace of mind that your vehicle is safe and secure. Whilst our warm waiting room provides tea and coffee making facilities, plus free WIFI, if you need to wait for work to be completed on your vehicle. We support female drivers and owners of Audi, BMW, BMW Mini and Mercedes and our vehicles services include MOT Testing, Servicing and Maintenance, Replacement Number Plates, Air Conditioning, Second-hand Car Checks, plus much more. who could benefit from our services, then please forward on our details.